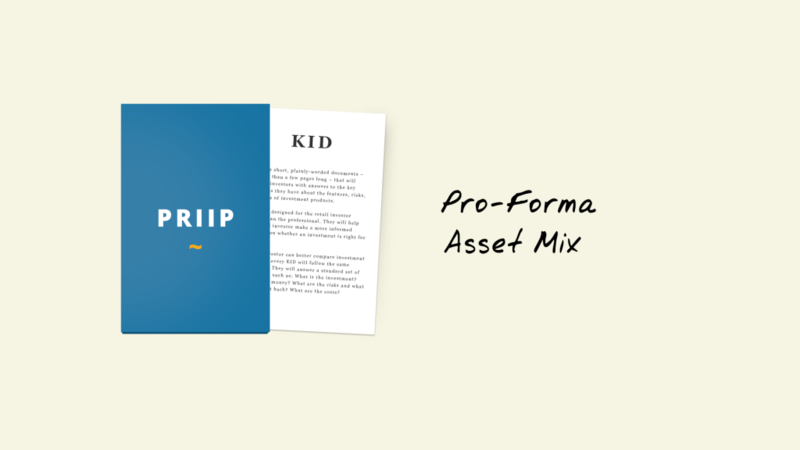 For the calculation of the Pro-Forma Asset Mix, the first step is to relate all positions – which could be found in the basket of the PRIIP – to one of the asset classes. After that, it’s necessary to determine the weighting/s of each asset class of the basket. Out of this weighting/s and the prescribed target allocation the “Pro-Forma Asset Allocation” which will be used for the further steps is calculated. The next step is to adjust all the respectives benchmarks – one benchmark for each asset class – accordingly to the dates of the given price series of the PRIIP and to calculate the returns of the adjusted benchmark series. This step must be done for all benchmark series which are necessary for the Pro-Forma Asset Mix. Given these returns and the weighting/s from the Pro-Forma Asset allocation a new price series is calculated – the Pro-Forma Asset Mix price series. With this price series, the VEV can be calculated as already described in our former blog posts for PRIIPs of all categories. After that, the VEV based on the Pro-Forma Asset Mix and the VEV based on the given price series of the PRIIP have to be compared and the one with the higher value is chosen for the determination of the MRM. How will KIDs for PRIIPs impact your business? Want to learn more about optimizing investment strategies and improving analytics?